Gita Arvind is a scientist by education. She lives in Redmond, Washington with her husband and two lovely girls. They keep her curious about everything, from Disney characters to human nature! Being a mother of a child with speech challenges, Gita is also deeply passionate about advocating for access to AAC for children with special communication needs. She wishes to share her daughter, Swati’s journey with AAC. The following is her account of this journey. Swati is a happy, nonverbal 10-year old, who loves going up to people and asking them to sing to her the songs that she likes. The way her face lights up with a smile when they oblige, is a sight that instantly warms my heart. Don’t you think that is what communication is all about? That is, being able to convey a message that helps you satisfy a need? Just so you know, in the instance above, Swati did not use speech to communicate, as she is nonverbal. Then, how did she do it, you might ask? Well, she used Augmentative and Alternative Communication (AAC) – specifically, an AAC App on her iPad. And this is something that I would like to talk to you about today. This is something very close to my heart. It was born out of a desire to ensure that other parents in India, do not have to go through the same heartache and pain that I went through when Swati was about 4 or 5 years old and was still not speaking a word. Each new speech therapist that we consulted, suggested a different approach. But, no one talked about AAC until much much later. They only insisted on trying speech. Finally, when Swati was around 6 years old, we tried Sign Language. But I found that it was a challenge for her because of the language’s heavy reliance on fine motor skills – and this was an issue for her. Furthermore, it is only understood by those who know sign language, to begin with. We then tried the Picture Exchange Communication System (PECS). That brought with it a different set of limitations. Swati mastered it so quickly, that we were running out of space on her picture books within no time! It was after seeing a bunch of speech therapists and professionals, reading and trying to gather as much information as I could, that I decided to try out an AAC App on my own, with Swati (who was around 7 years old then). Since then it has been a long journey to get to where we are now. Today, I finally feel validated in my decision to have introduced an AAC App to her. Today, Swati is able to independently make a sentence, to communicate what she wants. She does this on her device, which in turn speaks it out for her. At age 4 or 5, when she still wasn’t speaking, she would probably have had a meltdown while trying to communicate the same thing. Her pointing skill has improved. She is able to choose 1 icon from a grid of 4×8 buttons. Swati has to create sentences by choosing all the words required to communicate it. She is able to pay attention to the screen for the entire duration it takes for her to make a sentence. Swati’s receptive skills have improved because she can now show what she knows, by choosing the appropriate button on her device. Her expressive skills are also improving, as she learns to express more about what she knows, using her device. Most importantly, she is confident of being understood by anyone around her when she uses her device to communicate. That in itself contributes to an increase in self-esteem! Why do I want to make this case for access to AAC before speech? I have seen how Swati’s life has improved for the better since she began using AAC apps. Given this experience, I strongly feel that it is my responsibility to educate and inform more parents and caregivers in India about AAC. I want to stress whenever and wherever possible about giving children access to AAC at an early age. 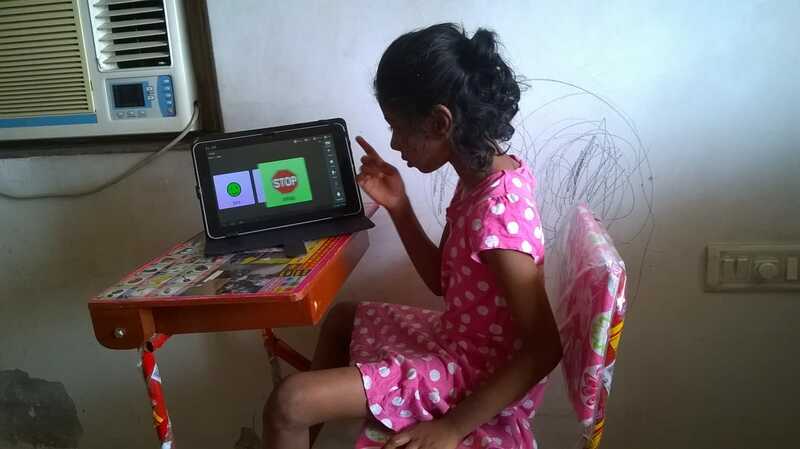 I sometimes wonder how much more progress Swati could have shown, had she been given access to AAC at 3 years of age or even earlier- the typical age when children start to speak. And it bothers me that even today, speech therapists and other allied professionals in India are still unaware of these advances in technology. It is disheartening that they continue to insist only on speech production to parents of children with speech delays. The app that we used for Swati was the Avaz App. This App is widely available in India and can be customized as per each child’s requirements. It is also available in many of our regional languages. That being said, Avaz is also more affordable compared to other AAC apps in the market and is much more user-friendly. Finally, I request all parents and caregivers out there not to be skeptical about AAC. Proactively consider introducing AAC to your child at an early age. We are really grateful to Gita for taking time and sharing her daughter’s story with us! Thanks for sharing your experiences, I am sure it will encourage many. Thanks for posting the change you saw in Swati’s life after introducing AAC.